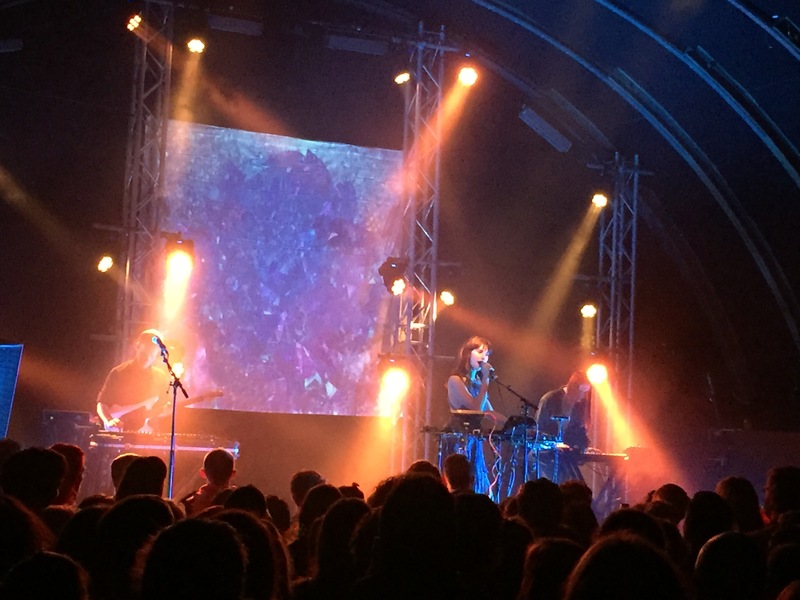 “Very meaningful,” is how Kimbra Johnson coolly describes her first gig in Australia in four years about midway through the first stop on her Primal Heart tour at Brisbane’s The Triffid on Monday night. Yep, meaningful. Yep, four years. Yep, Monday night. It’s not the most obvious choice for a triumphant return to a country to which she has ample musical links, but that didn’t stop a large and enthusiastic crowd gathering to collectively fend off the winter bite and enjoy some top tuneage under the arched roof of one of Brisbane’s finest venues. Exhibitionist – aka Brisbane’s Kirsty Tickle and band – set the tone with a half-hour set of sometimes smooth, sometimes brooding, sometimes dark pop. “Sorry, guys,” she smirks, as she introduces ‘Sally’s Song’ – written with Sally Seltmann with music industry misogyny firmly in the crosshairs. Meanwhile, French drummer Jonathan Boulet is grinning from ear to ear as he basks in Les Bleus’ recent World Cup triumph, before closer ‘Being a Woman’ is introduced as “a little bit aggressive”, and is widely appreciated for being exactly that. Now for something a whole lotta meaningful. New Zealander Kimbra takes to the stage amid a cacophony of vibration and expectation, taking her position stage-centre with the assurance of someone who has appeared on many of the biggest stages worldwide in the last few years. An early one-two of ‘The Good War’ and ‘Black Sky’ showcases the strength in depth on the Hamilton native’s third album as the singer strides across the stage surveying her domain, while singles ‘Human’ and ‘Like They Do on the TV’ get big responses from an audience finally starting to relax. ‘Settle Down’ keeps the mood high, before the sparse ‘Past Love’ breaks it all back down. After ‘Two Way Street’, Kimbra challenges her crowd to dance when ‘Sweet Relief’ brings the funk in spades. It’s a veritable musical smorgasboard with no obvious flaw or failing. All in all, when you look past the electicism, seemingly effortless style, and retina-threatening lights, it’s the 28-year-old’s powerful, soaring voice that’s the star of the show. Who knows what sort of meaningful stuff Kimbra can come up with in the next four years?